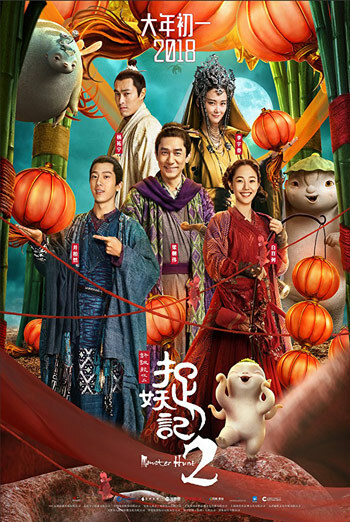 The story continues with Wuba after he parts way with his human parents Tian (Jing Boran) and Lan (Bai Baihe) for his own journey. Peace has not been restored in the monster world after the death of the evil monster king as a sinister lord has ascended and seized the throne. A heavy bounty is placed on Wuba dead or alive, forcing him to go into hiding again. He encounters an ill-famed gambler Tu (Tony Leung Chiu-wai) who’s deep in debt and seemingly up to no good. Together, they form a reluctant alliance in order to escape from their predicament. Things are looking up in the human world, as Tian sets out on a journey with Lan in search of his long-lost father. They meet the new chief of the Monster Hunter Bureau Yun (Yo Yang), who happens to know the whereabouts of Tian’s father. Just when they are getting closer to locating his father, the couple learns of the bounty placed on Wuba. They are being torn between finding their father and saving their son. Meanwhile, Wuba and Tu find themselves in deep water when they stumble upon a dark secret behind the Monster Hunter Bureau that threatens to reshape the balance of power between the human and monster world. Throughout the course of the adventure, Tu has come to realize the value of friendship and vows to protect Wuba. But even with Tian and Lan coming to the rescue, they have absolutely no idea what menacing force they are up against. Consumer Advice:(BC) Violence. (MB) Violence, frightening scenes. (ON) Violence, subtitled.